Poliovirus, the causative agent of polio (also known as poliomyelitis), is a member virus of Enterovirus C, in the family of Picornaviridae. 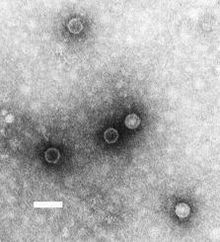 TEM micrograph of poliovirus virions. Scale bar, 50 nm. The replication cycle of poliovirus is initiated (1) by binding to the cell surface receptor CD155. The virion is taken up via endocytosis, and the viral RNA is released (2). Translation of the viral RNA occurs by an IRES-mediated mechanism (3). The polyprotein is cleaved, yielding mature viral proteins (4). The positive-sense RNA serves as template for complementary negative-strand synthesis, producing double-stranded replicative form (RF) RNA(5). Many positive strand RNA copies are produced from the single negative strand (6). The newly synthesized positive-sense RNA molecules can serve as templates for translation of more viral proteins (7) or can be enclosed in a capsid (8), which ultimately generates progeny virions. Lysis of the infected cell results in release of infectious progeny virions (9). 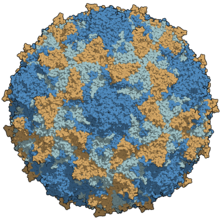 Poliovirus infects human cells by binding to an immunoglobulin-like receptor, CD155 (also known as the poliovirus receptor or PVR) on the cell surface. Interaction of poliovirus and CD155 facilitates an irreversible conformational change of the viral particle necessary for viral entry. Attached to the host cell membrane, entry of the viral nucleic acid was thought to occur one of two ways: via the formation of a pore in the plasma membrane through which the RNA is then “injected” into the host cell cytoplasm, or that the virus is taken up by receptor-mediated endocytosis. Recent experimental evidence supports the latter hypothesis and suggests that poliovirus binds to CD155 and is taken up by endocytosis. Immediately after internalization of the particle, the viral RNA is released. Poliovirus is a positive-stranded RNA virus. Thus, the genome enclosed within the viral particle can be used as messenger RNA and immediately translated by the host cell. On entry, the virus hijacks the cell's translation machinery, causing inhibition of cellular protein synthesis in favor of virus-specific protein production. Unlike the host cell's mRNAs, the 5' end of poliovirus RNA is extremely long—over 700 nucleotides—and highly structured. This region of the viral genome is called internal ribosome entry site (IRES), and it directs translation of the viral RNA. Genetic mutations in this region prevent viral protein production. The first IRES to be discovered was found in poliovirus RNA. Polioviruses were formerly classified as a distinct species belonging to the genus Enterovirus in the family Picornaviridae. In 2008, the Poliovirus species was eliminated and the three serotypes were assigned to the species Human enterovirus C (later renamed Enterovirus C), in the genus Enterovirus in the family Picornaviridae. The type species of the genus Enterovirus was changed from Poliovirus to (Human) Enterovirus C.
CD155 molecules complexed with a poliovirus particle. Reconstructed image from cryo-electron microscopy. ^ a b Hogle J (2002). "Poliovirus cell entry: common structural themes in viral cell entry pathways". Annu Rev Microbiol. 56: 677–702. doi:10.1146/annurev.micro.56.012302.160757. PMC 1500891. PMID 12142481. ^ a b c Goodsell DS (1998). The machinery of life. New York: Copernicus. ISBN 978-0-387-98273-1. ^ a b Paul JR (1971). A History of Poliomyelitis. (Yale studies in the history of science and medicine). New Haven, Conn: Yale University Press. ISBN 978-0-300-01324-5. ^ Racaniello and Baltimore; Baltimore, D (1981). "Molecular cloning of poliovirus cDNA and determination of the complete nucleotide sequence of the viral genome". Proc. Natl. Acad. Sci. U.S.A. 78 (8): 4887–91. Bibcode:1981PNAS...78.4887R. doi:10.1073/pnas.78.8.4887. PMC 320284. PMID 6272282. ^ Kitamura N, Semler B, Rothberg P, et al. (1981). "Primary structure, gene organization and polypeptide expression of poliovirus RNA". Nature. 291 (5816): 547–53. Bibcode:1981Natur.291..547K. doi:10.1038/291547a0. PMID 6264310. ^ a b c De Jesus NH (2007). "Epidemics to eradication: the modern history of poliomyelitis". Virol. J. 4 (1): 70. doi:10.1186/1743-422X-4-70. PMC 1947962. PMID 17623069. ^ a b He Y, Mueller S, Chipman P, et al. (2003). "Complexes of poliovirus serotypes with their common cellular receptor, CD155". J Virol. 77 (8): 4827–35. doi:10.1128/JVI.77.8.4827-4835.2003. PMC 152153. PMID 12663789. ^ Dunnebacke TH, Levinthal JD, Williams RC (1 October 1969). "Entry and release of poliovirus as observed by electron microscopy of cultured cells". J. Virol. 4 (4): 505–13. PMC 375900. PMID 4309884. ^ Kaplan G, Freistadt MS, Racaniello VR (1 October 1990). "Neutralization of poliovirus by cell receptors expressed in insect cells". J. Virol. 64 (10): 4697–702. PMC 247955. PMID 2168959. ^ Gómez Yafal A, Kaplan G, Racaniello VR, Hogle JM (November 1993). "Characterization of poliovirus conformational alteration mediated by soluble cell receptors". Virology. 197 (1): 501–5. doi:10.1006/viro.1993.1621. PMID 8212594. ^ a b Mueller S, Wimmer E, Cello J (2005). "Poliovirus and poliomyelitis: a tale of guts, brains, and an accidental event". Virus Res. 111 (2): 175–93. doi:10.1016/j.virusres.2005.04.008. PMID 15885840. ^ Brandenburg B, Lee LY, Lakadamyali M, Rust MJ, Zhuang X, Hogle JM (2007). "Imaging poliovirus entry in live cells". PLOS Biology. 5 (7): e183. doi:10.1371/journal.pbio.0050183. PMC 1914398. PMID 17622193. ^ Attardi G, Smith J (1962). "Virus specific protein and a ribo-nucleic acid associated with ribosomes in poliovirus infected HeLa cells". Cold Spring Harb. Symp. Quant. Biol. 27: 271–92. PMID 13965389. ^ Chen CY, Sarnow P (1995). "Initiation of protein synthesis by the eukaryotic translational apparatus on circular RNAs". Science. 268 (5209): 415–7. Bibcode:1995Sci...268..415C. doi:10.1126/science.7536344. PMID 7536344. ^ Pelletier J, Sonenberg N (1988). "Internal initiation of translation of eukaryotic mRNA directed by a sequence derived from poliovirus RNA". Nature. 334 (6180): 320–5. Bibcode:1988Natur.334..320P. doi:10.1038/334320a0. PMID 2839775. ^ Jang SK, Kräusslich HG, Nicklin MJ, Duke GM, Palmenberg AC, Wimmer E (1 August 1988). "A segment of the 5' nontranslated region of encephalomyocarditis virus RNA directs internal entry of ribosomes during in vitro translation". J. Virol. 62 (8): 2636–43. PMC 253694. PMID 2839690. ^ Charles Chan and Roberto Neisa. "Poliomyelitis". Archived February 22, 2007, at the Wayback Machine Brown University. ^ a b c d Kew O, Sutter R, de Gourville E, Dowdle W, Pallansch M (2005). "Vaccine-derived polioviruses and the endgame strategy for global polio eradication" (PDF). Annu Rev Microbiol. 59: 587–635. doi:10.1146/annurev.micro.58.030603.123625. PMID 16153180. ^ Jiang P, Faase JA, Toyoda H, et al. (2007). "Evidence for emergence of diverse polioviruses from C-cluster Coxsackie A viruses and implications for global poliovirus eradication". Proc. Natl. Acad. Sci. U.S.A. 104 (22): 9457–62. Bibcode:2007PNAS..104.9457J. doi:10.1073/pnas.0700451104. PMC 1874223. PMID 17517601. ^ Jorba J, Campagnoli R, De L, Kew O (2008). "Calibration of multiple poliovirus molecular clocks covering an extended evolutionary range". J. Virol. 82 (9): 4429–40. doi:10.1128/JVI.02354-07. PMC 2293050. PMID 18287242. ^ Rothberg PG, Wimmer E (1981). "Mononucleotide and dinucleotide frequencies, and codon usage in poliovirion RNA". Nucleic Acids Res. 9 (23): 6221–9. doi:10.1093/nar/9.23.6221. PMC 327599. PMID 6275352. ^ Zhang J, Wang M, Liu WQ, et al. (2011). "Analysis of codon usage and nucleotide composition bias in polioviruses". Virol. J. 8: 146. doi:10.1186/1743-422X-8-146. PMC 3079669. PMID 21450075. ^ Carstens, E. B.; Ball, L. A. (July 2009). "Ratification vote on taxonomic proposals to the International Committee on Taxonomy of Viruses (2008)" (PDF). Archives of Virology. 154 (7): 1181–8. doi:10.1007/s00705-009-0400-2. ISSN 1432-8798. PMID 19495937. ^ Sabin A (1956). "Pathogenesis of poliomyelitis; reappraisal in the light of new data". Science. 123 (3209): 1151–7. Bibcode:1956Sci...123.1151S. doi:10.1126/science.123.3209.1151. PMID 13337331. ^ Ren R, Racaniello V (1992). "Poliovirus spreads from muscle to the central nervous system by neural pathways". J Infect Dis. 166 (4): 747–52. doi:10.1093/infdis/166.4.747. PMID 1326581. ^ Lancaster KZ, Pfeiffer JK (2010). Gale, Michael (ed.). "Limited trafficking of a neurotropic virus through inefficient retrograde axonal transport and the type I interferon response". PLoS Pathog. 6 (3): e1000791. doi:10.1371/journal.ppat.1000791. PMC 2832671. PMID 20221252. ^ Ida-Hosonuma M, Iwasaki T, Yoshikawa T, et al. (April 2005). "The alpha/beta interferon response controls tissue tropism and pathogenicity of poliovirus". J. Virol. 79 (7): 4460–9. doi:10.1128/JVI.79.7.4460-4469.2005. PMC 1061561. PMID 15767446. ^ Ohka S, Igarashi H, Sakai M, Koike S, Nochi T, Kiyono A, Nomoto A (2007). "Establishment of a poliovirus oral infection system in human poliovirus receptor-expressing transgenic mice that are deficient in alpha/beta interferon receptor". J. Virol. 81 (15): 7902–12. doi:10.1128/JVI.02675-06. PMC 1951287. PMID 17507470. ^ Ren RB, Costantini F, Gorgacz EJ, Lee JJ, Racaniello VR (1990). "Transgenic mice expressing a human poliovirus receptor: a new model for poliomyelitis". Cell. 63 (2): 353–62. doi:10.1016/0092-8674(90)90168-E. PMID 2170026. ^ Koike S, Taya C, Kurata T, et al. (1991). "Transgenic mice susceptible to poliovirus". Proc. Natl. Acad. Sci. U.S.A. 88 (3): 951–5. Bibcode:1991PNAS...88..951K. doi:10.1073/pnas.88.3.951. PMC 50932. PMID 1846972. ^ Horie H, Koike S, Kurata T, et al. (1 February 1994). "Transgenic mice carrying the human poliovirus receptor: new animal models for study of poliovirus neurovirulence". J. Virol. 68 (2): 681–8. PMC 236503. PMID 8289371. ^ Ohka S, Nomoto A (2001). "Recent insights into poliovirus pathogenesis". Trends Microbiol. 9 (10): 501–6. doi:10.1016/S0966-842X(01)02200-4. PMID 11597452. ^ Koike S, Taya C, Aoki J, et al. (1994). "Characterization of three different transgenic mouse lines that carry human poliovirus receptor gene—influence of the transgene expression on pathogenesis". Arch. Virol. 139 (3–4): 351–63. doi:10.1007/BF01310797. PMID 7832641. ^ a b Nagata N, Iwasaki T, Ami Y, Sato Y, Hatano I, Harashima A, et al. (March 2004). "A poliomyelitis model through mucosal infection in transgenic mice bearing human poliovirus receptor, TgPVR21". Virology. 321 (1): 87–100. doi:10.1016/j.virol.2003.12.008. PMID 15033568. ^ Dragunsky E, Nomura T, Karpinski K, et al. (2003). "Transgenic mice as an alternative to monkeys for neurovirulence testing of live oral poliovirus vaccine: validation by a WHO collaborative study". Bull. World Health Organ. 81 (4): 251–60. doi:10.1590/S0042-96862003000400006 (inactive 2019-02-05). PMC 2572431. PMID 12764491. ^ Racaniello V, Baltimore D (1981). "Cloned poliovirus complemenatry DNA is infectious in mammalian cells". Science. 214 (453): 916–9. Bibcode:1981Sci...214..916R. doi:10.1126/science.6272391. PMID 6272391. ^ Cello J, Paul AV, Wimmer E (2002). "Chemical synthesis of poliovirus cDNA: generation of infectious virus in the absence of natural template". Science. 297 (5583): 1016–8. Bibcode:2002Sci...297.1016C. doi:10.1126/science.1072266. PMID 12114528. ^ Couzin J (2002). "Virology. Active poliovirus baked from scratch". Science. 297 (5579): 174–5. doi:10.1126/science.297.5579.174b. PMID 12114601. ^ Brown MC, Dobrikova EY, Dobrikov MI, Walton RW, Gemberling SL, Nair SK, Desjardins A, Sampson JH, Friedman HS, Friedman AH, Tyler DS, Bigner DD, Gromeier M (November 2014). "Oncolytic polio virotherapy of cancer". Cancer. 120 (21): 3277–86. doi:10.1002/cncr.28862. PMC 4205207. PMID 24939611.